Indium Smart Flashlight | OhGizmo! 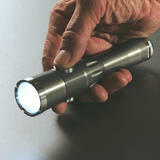 The Angus Noble Indium Smart Flashlight is the World’s First PC Programmable Flashlight. More at The Gadget Blog. Also, you can visit the company website.